Without making much judgment not knowing its price, the Acer HMD is the sharpest and lightest HMD we’ve tested yet. With the potential to cost $200 left than a Rift, Oculus and HTC better think of something -- and fast. 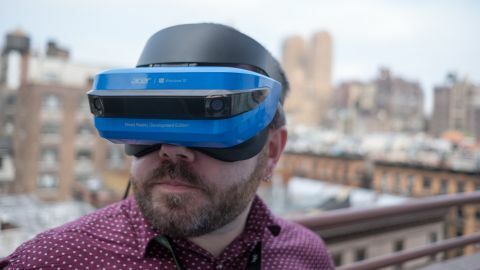 First unveiled during CES 2017 and expanded upon during GDC 2017, Acer’s plainly named Mixed Reality Head-Mounted Display (HMD) has been shown off in full during the company’s annual April media event in New York City. Acer’s HMD, while we’ve yet to learn its price officially, will likely undercut the competition by a considerable margin -- Microsoft says that the Windows HMDs following its spec, like this one, will start at just $299 -- with comparable hardware inside and capabilities for VR experiences. Finally, Oculus Rift and HTC Vive finally have someone else in the PC virtual reality (VR) space to worry about. And, having tested out the device firsthand, we can attest to the Acer HMD’s visual fidelity as well as its comfort. Spoiler: both are pretty top notch. The Acer HMD shares a lot of design language with Sony’s PlayStation VR headset, with a single, easily adjustable plastic band resting around the head and a cushion on the forehead piece. Better yet, the display portion of the device that rests on this forehead piece sits on a hinge that flips the device upward for easier visual access to the real world. Wearing the Acer HMD also feels far lighter than any PC-based VR headset we’ve tested yet: just 350g (not counting the attached HDMI-meets-USB 2.0 cord). There’s no feeling of something hanging off of your face, though that depends upon how tightly you adjust the plastic band. Better yet, Acer’s designed the foam padding that cups your face to practically eliminate light (i.e. reality) bleeding through and ruining your immersion. It’s a welcome merging of design ideas between that of Sony and Oculus that we’re glad basically every Windows 10 HMD seems to be adopting. That said, the curvature of the lenses is a little obvious, distorting images at their edges. Granted, this is something that perhaps could be fixed before release later this year. What’s most exciting about the Acer HMD’s design, and the forthcoming Windows 10 HMDs in general, is that it’s one device driving the whole experience. Microsoft and Acer have brought the position tracking cameras into the very HMD in question. This means that there are no additional sensors or other devices to consider when setting up the Acer HMD. (Just bring your own headphones and plug them into the top of the display.) During setup, the HMD’s cameras require you to report your height while placing the device upright in front of your computer screen. After a few other steps, you’re off to the races. Once inside of Microsoft’s mixed reality demo, a virtual representation of the Windows 10 operating system, we noticed how sharp the imagery was, and how little stutter there was in response to movement. Both are testament to the Acer HMD’s 90Hz refresh rate and 2,880 x 1,440 effective resolution (1,440 x 1,440 for each lens). That latter point actually sets the Acer HMD above both the Oculus Rift and HTC Vive, which are both at 2,160 x 1,200 effective resolution. And that point definitely shows when viewing calendar updates, emails and the weather in Windows 10 Holographic. Reading text using either of those competing headsets is, frankly, difficult -- not so on the Acer HMD. To be clear, the Acer HMD’s cameras cannot deliver a live view of the natural environment through its viewing lenses. Those cameras are purely for positional tracking, delivering Microsoft’s spec for its 6DOF, or six degrees of freedom, technology. This, essentially, makes the Acer HMD a virtual reality headset, albeit the lightest and sharpest one we’ve tried yet. It’s a bummer because it’s, to put it bluntly, missed potential. It also puts Microsoft’s definition of “mixed reality” into question. While we may expect mixed reality to “mix” the real and virtual worlds, much like the existing HoloLens does, that’s not what Microsoft is expecting from these devices. At least at first. Microsoft considers mixed reality to emulate the nature of the real world within the virtual one, regardless of whether that’s through realistic positional tracking or via physical devices that represent virtual objects, e.g. the Oculus Rift and HTC Vive controllers. We’re told that, given that this is the very first Windows HMD to show itself to the press and developers, that nothing is off the table for future devices in regards to these capabilities. The Acer Mixed Reality Head-Mounted Display is, bar one, one of the most comfortable and visually impressive HMDs that we’ve tested so far. It’s far lighter and sharper than the competition, and arguably utilizes a superior design in terms of fit. While we have trouble seeing ourselves performing common Windows tasks with an HMD on, the fact that the platform very much is Windows 10 means less overhead than experienced with Oculus Rift and HTC Vive’s dedicated apps. It’s tough to make much judgment on the Acer HMD not knowing its price, but it’s highly unlikely that this device will cost as much as an Oculus Rift. If our suspicion turns out to be true, then Oculus and HTC better think of something -- and fast.